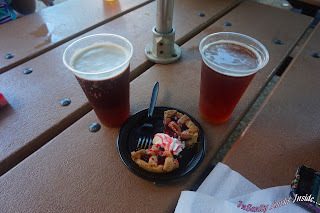 We here at InSanity lurks Inside completely LOVE festivals that mix two of our favorite things, Drinking Adult-type beverages and Tasty Food! So when we heard that Busch Gardens Williamsburg was opening their very first "Food and Wine Festival" we got excited! Needless to say our excitement was doubled when Busch Gardens responded to our inquiry about reviewing this event, we packed up and high-tailed it south! Event Rating: Great but prices are a bit high. To start we made a stop at guest services right at the beginning. 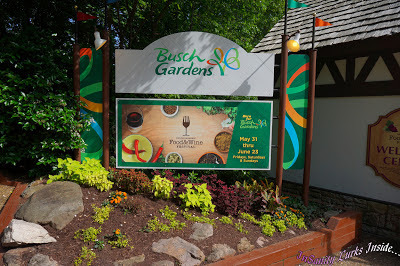 Busch Gardens offers a wonderful wrist band program which you can link to your credit card. Thus allowing you to go cash free (or in my case, purse free) for your day by allowing you to charge to a general account! With this account you can either go limited (say $100) or unlimited depending on your spending ability. 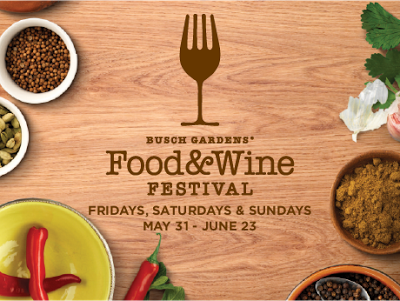 This is a splendid little tool for their Food and Wine Festival but is offered all year. However, a word of warning! I'd suggest using a credit card only for this, not your debt/bank card as it takes $50 authorizations as your original $50 runs low. This really isn't much of an issue but depending on your bank, those authorizations may hang around for a few days tying up your money. So think about that in advance! Carrie, Shut Up and get to the FOOD AND DRINKS! Alright, to begin we grabbed our festival guide along with our "magic wrist-bands" and got down to the serious business. We headed straight to Grogan's Pub in Ireland for "breakfast" which was Bold Rock Hard Cider! This cider is light and delicious, not exactly dry but not to fruity either. Always a good place to begin, from here we planned our attack strategy. Our strategy being, we have none! 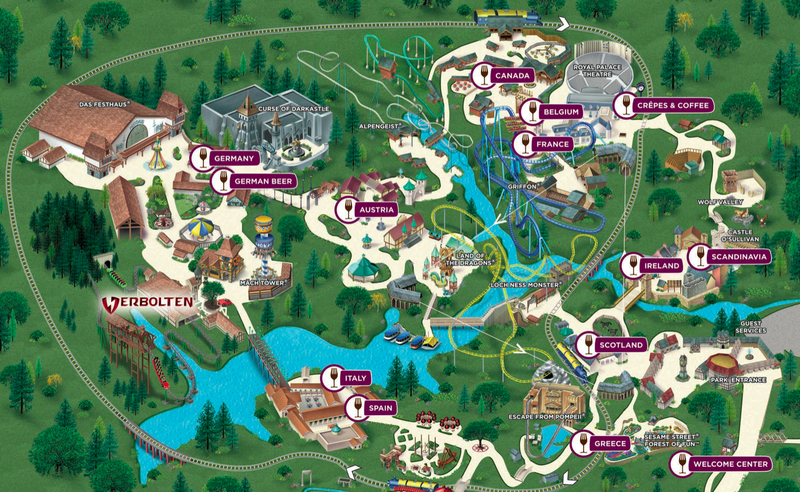 We pretty much headed towards what we thought we wanted to try the most, then backtracked to the other locations. The very first stop on our trip was Scandinavia, which was right in Ireland. Perfectly convenient! They've got a ton of fun and interesting offerings for both food and wine. Gravad Lax Rarakor (Cured Salmon on a Potato Pancake), Kottbullar (Swedish Meatballs with Lingonberry Jam) and Krumkake (Waffle cone cookie with hazelnut cream and berry pudding). For Wine they offer Kijafa Cherry Wine, Ingleside Chardonnay and Ingleside Cabernet-Merlot. Plus they have a delicious cocktail offering called Frozen Dirty Shirley (alcoholic Shirley Temple). 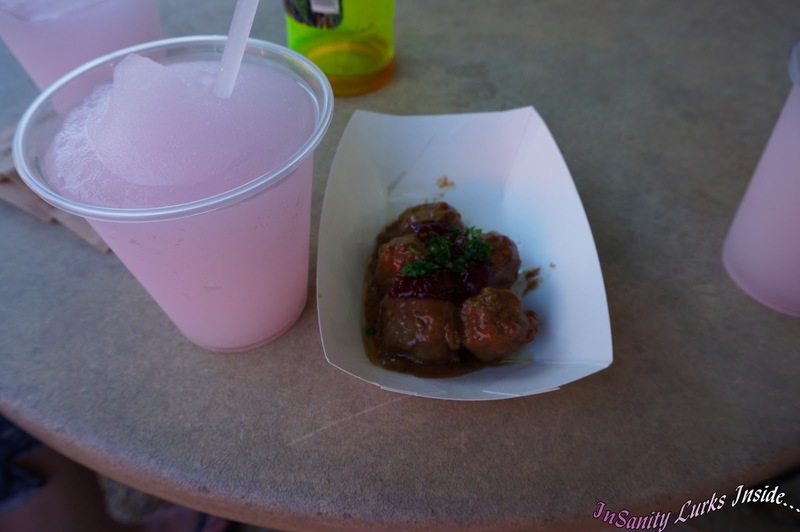 We tried the Swedish meatballs, they where very good but a little bit greasey and the Frozen Dirty Shirley, which was excellent. From here we headed towards Scotland in search of Ginger Beer and Scotch Eggs! Sadly, they didn't have any of the Scotch Eggs ready so we opted for the Crabbies Ginger Beer instead. Oh, the things I could say, you are excellent and I can see myself easily consuming a case of your delicious brew. Sadly by the end of the day they were completely OUT of Crabbies, we were very disappointed! In other choices Scotland has Shepherd's Pie (made with lamb), Chilled Pea Soup and Scottish Toffee. 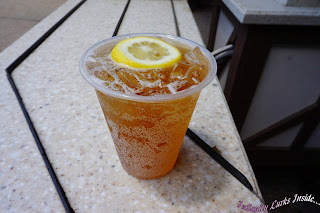 Their beer offerings are Boddingtons and Crabbies Ginger Beer. Wine offerings are Chateau Morrisette Vidal Blanc and Horton Route 33 Red. 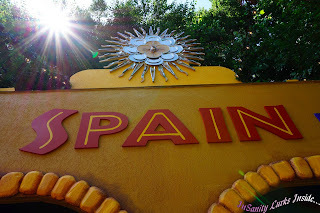 Like the sometimes odd people we are, we then backtracked across the park towards the Spain booth in search of what we were told was a very tasty Sangria! Spain offered a Chorizo Empanada (Spicy pork sausage pastry), Tapas (Almonds, Olive Medley and Cheese), Venera con Jamon (Scallops wrapped in Ham) and a Hazelnut Custard. Their only cocktail was Pancho Sangria, we only went after this offering which I found both fruity and bit drier then my own tastes enjoy. However, it was still delicious! Up next was one we were really looking forward too, Italy! Considering of the three people involved in this trip, two of us are at least half Italian, it had to happen! After eying the menu offerings, we decided on the Cannoli with a Lemoncello chaser and a glass of Casteggio Pinot Grigio. The other offerings from Italy: Italian Cheese Sampling, an Antipasto Platter (Meats, Olives and Cheese), Caprese Salad, Tiramisu and Panna Cotta. The beer was Peroni and Lemoncello was the cocktail. 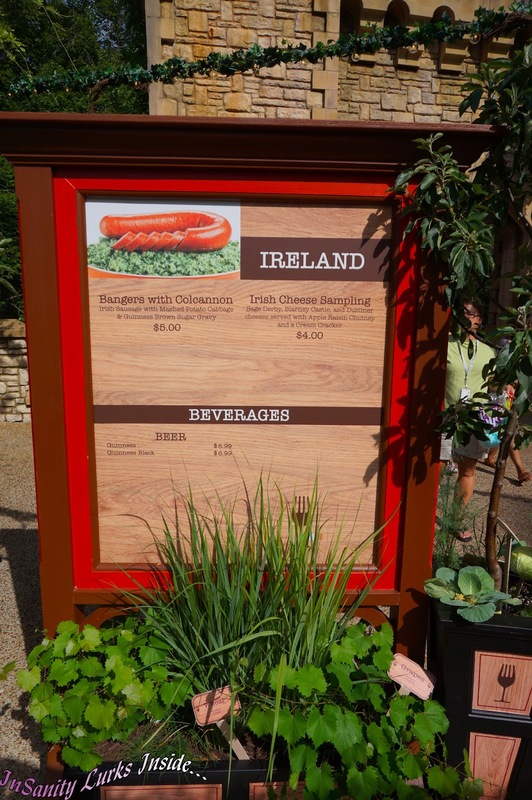 The wine list was naturally the most impressive in the park with the following offerings: Octave Vinho Verde, Piccolo Gavi de Gavi, Enza Prosecco, Casteggio Barbera, Casteggio Pinot Grigio, Donna Laura Chianti, Mochetto Pink Moscato and Barboursville Phileo. The Cannoli was delicious, not greasy like some you find and with just enough hidden chocolate to make anyone pleased. The Lemoncello was outstanding, chilled and delicious with a flavor you can't find from domestically available offerings and the Pinot was light and floral. Now happily pleased on Lemoncello and with enough sugar in our systems to send a diabetic into shock, we headed straight towards the German offerings! Not only did these sound delicious, you could smell them from the moment you got into that area. Making a beeline to the booth we jumped in line and made our order! 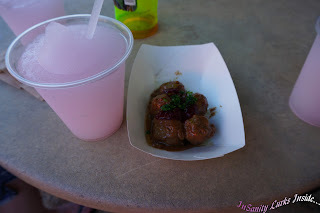 The German food offerings are Schinken Nudel (Noodle bake with ham and cheese), Currywurst (Knockwurst with Curry spices and potatoes), Rahmgulasch (Veal Stew) and Griesspudding with Blackberry Compote. Beer choices are Paulaner, Konig Pilsner and Weihenstephaner. Wine was Zepplin Riesling, Affentaler Pinot Noir, White Hall Gewurztraminer and Petit Verdot. Of these we had the Schinken Nudel which was creamy with the perfect balance of noodles, cheese and delicious smoky ham. 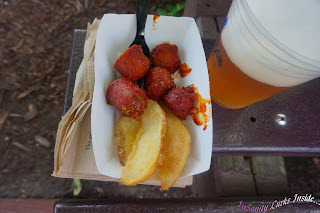 The Currywurst which was the right level of spicy allowing for both of flavors of the meat and spices to mingle. Our beer choices where the Konig and Weihenstephaner, both of which were a bit heavy for the heat but delicious with the meals. Right near Germany we found Austria, which seemed to be the perfect time for yet another dessert testing. Their food offerings looked delicious but we, being still rather full from Germany, needed something sweet to balance our savory. Austria offers Paprikash (Sweet Paprika Chicken Stew), Schnitzelwich (Pork Schnitzel Slider), Tafelspitz mit Apfelkren (Braised Beef Sirlion) and Linzer Torte (Cookie Crust Torte with Raspberry filling). For Beer they offered Devils Backbone Vienna Lager, St. George Spring Ale and Weihenstephaner Dunkel. We had the Linzer Torte which was seriously sweet and bursting with with raspberry flavor as well as both the Devils Backbone and Weihenstephaner. Both beers were delicious but also very heavy for the heat of the day. Being very full and waiting for some digestion to make room, we took this time for a nice long break to enjoy several rides and some prime-time people watching. After a decent bit of relaxing, we headed towards our next option, Canada! The offerings here are Cheddar and Lager Chower, Venison Sausage and Corn Porridge and Pumpkin Caramel Mousse. 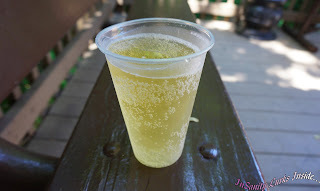 Beer choices are Wyder's Pear Cider, Moosehead and Molsen Canadian. Wine choices are Jackson-Triggs Ice Wine, Bordeaux Chateau Lagrange, Williamsburg Acte 12 Chardonnay and Rockbridge Pinot Noir. Here we went straight after the Venison Sausage and the Wyder's Pear Cider. 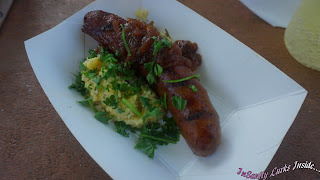 The sausage was amazing, with none of the 'gamey' taste that sometimes happens when dealing in venison meat. It was perfect with the sweet and slightly dry flavor of the Pear Cider, we'd recommend both! Already so close to finishing up our crazy tour we began again in France. 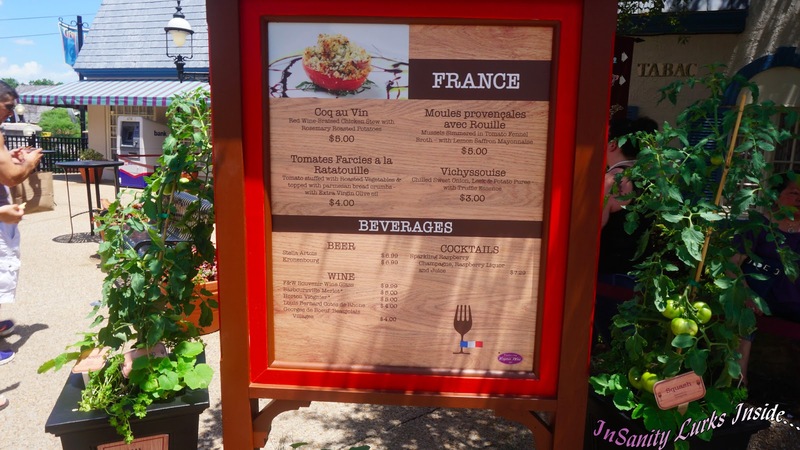 Sadly, we didn't spot any desserts at the French Pavilion which offered many rich food choices. Coq au Vin (Red Wine Chicken), Vichyssolse (Chilled Onion, Leak and Potato Puree), Tomates Farcies a la Ratatouille (Stuffed Tomato) and Moules Provencales avec Rouille (Mussels in Tomato and Lemon Sauce). The Beer choices are Stella Artois and Kronengourg. The cocktail offering was a Sparkling Raspberry (Champagne, Raspberry Liqour and Juice). Wine list was Louis Bernard Cotes du Rhone, Georges Duboeuf Beaujolais, Barboursville Merlot and Horton Viognier. Spotting the chance for another strange cocktail, we snapped up the Sparkling Raspberry. While delicious, it was VERY tart to the point it honestly needed something to sweeten it in order to really taste any flavor. Personally, we added sprite which made the cocktail something amazing. This allowed us to taste the zing of the champagne and raspberries and the tart of the juice. Having already had our drink, we moved onto the next stand which was also in France called Crepes and Coffee. Here we found a rich offering of sweet crepes such as Strawberries and Cream, Blueberries with Lemon to Hazelnut-Chocolate with Bananas. 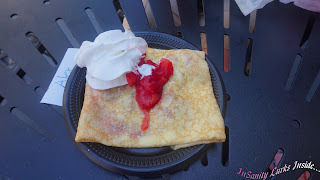 We opted for the Wine soaked strawberries and creme, which also had a good balance of sweet and tart, the perfect breakfast after a cocktail on what as proving to be a very humid day. Already we'd covered so much ground, we scanned our guide to see what we'd missed. Greece! So we headed in the general direction of Escape from Pompeii and the Greek stand. 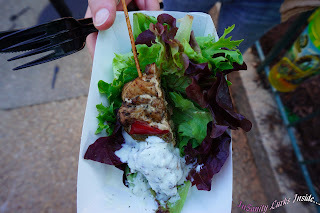 Once arriving we scanned the options which included Halloumi (Cheese, Honey and Pistachios), Souvlaki Tzatziki (Roasted Pork and Pepper Skewer), Salata (Greek Salad with Lemon Vinaigrette) and Baklava. Wine offerings where Elios Mediterranean White and Red Blend as well as Barboursville Sauvignon Black and Cabernet Franc. The Cocktail offering was Ouzo. Our choice was the Souvlaki Tzatziki which was both spicy and sweet, the yogurt sauce was perfect to complement the pork. Our last stop on this crazy tour was Ireland, which offered what we all found to be good traditional Irish fare with a twist. 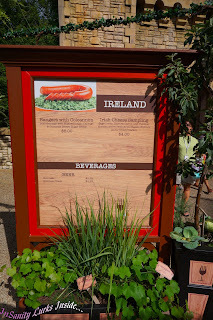 They had Banger with Colcannon (Sausage with Potato/Cabbage Casserole) and an Irish Cheese Sampling. For beer, the traditional Guinness and Guinness Black. Having plenty of Irish cooking at home, we opted to skip the food and went towards Guinness (which we refer to as 'liquid bread'). Naturally, it was Guinness although not served in the traditional 'warm' style. Overall we found this first annual Food and Wine Festival to be a nice mix of offerings. While we felt prices for the dishes and alcoholic offerings to be a bit on the high side, those offerings were entirely excellent in flavor and matched well with their perspective areas. From everything offered I wish we would have had more time in order to try even more choices. Throughout the event they also have artist tables set up. 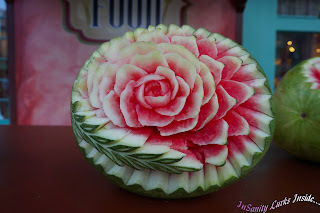 Showing off various food skills such as sugar carving and scrupled sugar art as well as melon carving. 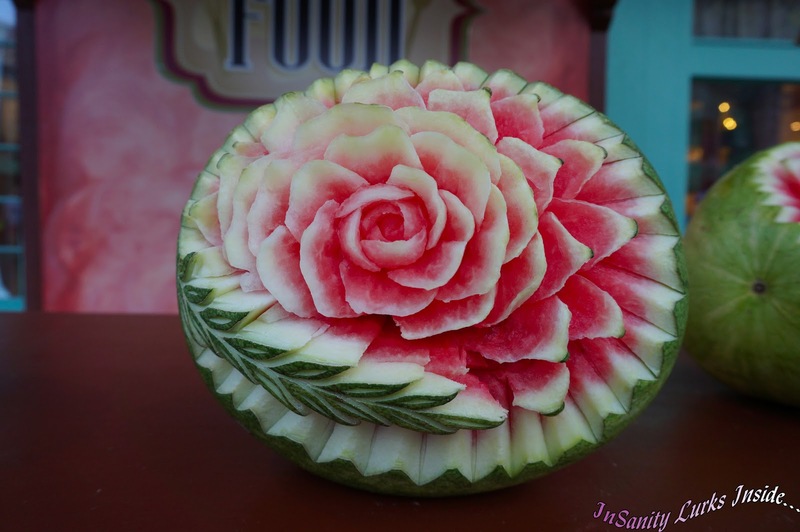 These are done live throughout the day and then displayed once the artists finish. Not mentioned or pictured above are the Beer Flights. Some countries also offer Beer Samplings called "Beer Flights", countries like Belgium and Germany offer two options. Each featuring four different beers for your tasting enjoyment. We didn't get a chance to try these as we really were entirely busy trying to enjoy all the other food and drinking options (as well as the attractions). However, one thing I did find slightly annoying was that so many offerings included Hazelnut. While I'm not allergic to tree nuts, many people are and personally I'm not a fan of the flavor. In the future I hope they will think to offer more allergy (and picky-eater) friendly choices. The same can be said about the seafood offerings, while not as numerous as the Hazelnuts, the servers couldn't assure me they hadn't been in contact with the other foods. For this reason (as I do have a seafood allergy) I tended to avoid eating at the stands which offered seafood. The exception to that was Scandinavia which assured me all their food was prepared and visibly served separate from any seafood. This is an excellent first year event for Busch Gardens Williamsburg and I'd highly recommend it to anyone. 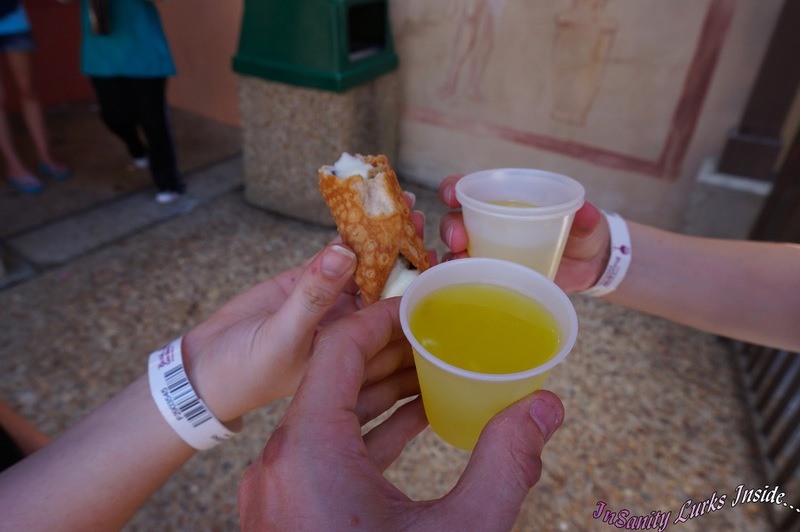 Not only do you get a beautiful theme park atmosphere you have dozens of delicious choices to sample! There is something on the menus for everyone and a lot of new things for everyone to try. Hopefully in the future they will continue to add more countries with even more eclectic and delicious choices.